Unfortunately, it’s not the first time we’ve seen this reaction. And, I’m okay with that. I only tell this story because time and time again I hear people comment that it must be “hard” to be a clergy family. They feel bad for our children because they wear the “PK” label. The general impression is that we operate outside of “ordinary” life. For some the word “clergy” is quickly linked with judgemental, hypocritical, strict and even boring. Hey, we’re all entitled to our own opinions! But for me, it’s just another addendum to that file I mentioned earlier–you know the one titled “things that make you go hmmmm….” So, I would like to state for the record that we’re just about as ordinary as people get. You don’t have to feel bad for us or think that we live this horrible, sheltered, recluse life. We actually laugh (a lot,) disagree occasionally, hang out at places outside of the church, and sometimes we even have interesting things to say (and it’s not always about church!) Being a clergy family really isn’t all that awful…in fact, it might actually be AWESOME. And that’s really what I wanted to share with you today. So while every vocation comes with its own share of good and bad…ministry comes with an amazingly huge amount of AWESOME! Not just the parking-angels-smiled-on-me-today or I-found-an-extra-$20-in-my-pocket kind of awesome, but the kind of AWESOME that only God can provide. Working in a church and being a part of a community of believers comes with a lot of God-moments. These are the kind of things regularly lifted up as part of Sunday morning worship, in prayer chains and sprinkled in conversations all over the church. These are the incidents where the impossible becomes possible. The times where generosity and grace exude from every direction and you just know you’re in the midst of something amazing and special. And the greatest part is that these AWESOME moments are not confined to the walls of the church building. This is the part of our life that I wish I could just wrap up and share with everyone…because it’s not exclusive to clergy families. It is ready and available to everyone. God’s desire for creation is that we live with our eyes and hearts open to the AWESOME moments. Saying YES to Jesus is saying YES to life. Taking nothing for granted, grateful for the good things and seeking out the unexpected. This is what God can do! Throughout Steve’s ministry we have been blessed time and time again. Please do not receive this sentence as boastful. I type it in the most humble manner possible. As a kid I remember feeling God’s presence and the comfort and security only He can offer. Today, as I’ve grown in my own faith, I feel God’s presence not only with the promise of comfort and security, but alongside the assurance of joy and hope! Our life isn’t easy. No life is easy. We all struggle, we all worry, we all fall short, but I am so glad that I never go through anything, good or bad, alone. NEVER. Outside of a loving relationship with our Creator and Savior, I think fellowship among believers is one of God’s greatest gifts to us. Have you seen the good that a church body can do? I can tell you that this kind of support and encouragement cannot be matched. When people say “church family” the key word is family! I cannot imagine life without these treasured friends and we’ve been privileged to be a part of many church families that remain near and dear to our hearts despite the miles. God is good all the time. And all the time…God is good. In reality parenthood is everything they said it would be…good, bad, frustrating and rewarding. We love our kiddos and I’m pretty sure the cycle of life isn’t going anywhere! However, it’s come to my attention lately that dealing with my kids is getting a lot more complicated. When they were little they exemplified typical “little” people behavior. The moments of defiance and cuteness along with the awe of learning new things were just part of a normal day. And newsflash–probably none of our children were truly exceptional at this point. In fact, I’ve read several studies that suggest that most of our children all level out in kindergarten. That means despite being the product of a stay-at-home mom, single-parent household, working parents, or daycare (home or otherwise,) all of our kiddos have reached the same milestones at this particular crossroad in life. The differences become evident after our children enter school and not necessarily because of school itself. It appears that a child’s personality begins to develop and solidify all within the first few years of elementary school (barring any huge life events, of course.) I am not a psychologist, but I think the stats hold up. An even-tempered child at age 6 likely maintains that even temper. A selfish child at age 7 probably has selfish tendencies throughout life. A sensitive demeanor at age 8 means the child has a good chance of maintaining that sensitivity well into adulthood. I’m pretty sure I was not your typical child. In a lot of ways I was probably always a little bit of a grown up…or perhaps an old soul. I was thoughtful in ways that most kids never think of…weighing the pros and cons of many decisions that others wouldn’t even consider. I was very self-concerned and stubborn. I worked hard. By the time I was 8 I knew I wanted to go to college and I was driven to get there. I was shy and serious. I was afraid of failure. I WAS BY NO MEANS PERFECT. I put a lot of pressure on myself. I hated making mistakes and vowed to learn from them. I felt very safe and secure with my family. I was creative. I didn’t really care what other people thought of me. I believed in a God who loved me and would never abandon me. This is how I “remember” my childhood, but this alone doesn’t garner enough information on how to raise a child…especially a child that in all likelihood would be very different from myself. Oh, how I wish I had realized all this earlier! Possessing an awareness that there are and will be differences is key to navigating my parenting responsibilities now and into the future. This newfound credo of “he’s not you, and she’s not me,” might be the saving grace that I need to get over this parenting hump. Stepping back and realizing that we are all separate individuals and that our differences are okay (heck, we might even learn something from one another) could make these next years a growing experience for us all. I know that the head to head battles will exist (there’s no way I’m going to let them grow up without a sense of accountability and purpose,) but hopefully the battles will also include some level of understanding. I truly love these kiddos and I want to love them into being the people God called them to be…not a “mini-me” clone and certainly not the “ideal” person that lives in my imagination. Most of us hope to raise children to be more than ourselves…we seek to give them not only the things that we had growing up but so much more. We want them to have the benefit of all those who have come before them…us included. The long-held belief that each generation should be better than the one before drives us in so many ways, but it’s also a belief that can cause us to “run-over” our own children. A lack of understanding can stop them in their tracks before they’ve even had a chance to start…and we’ve all seen it happen far too many times. My kids will not have a childhood experience that mirrors mine. Their friendships and relationships will look different from the ones I knew 30+ years ago. They will stumble and fall. They will let me down and they will find a strength that I never knew they could possess. These same kiddos will test the waters and sometimes they will get hurt. They will succeed in areas where I’ve failed and they will thrive in places I would have been too afraid to venture into. 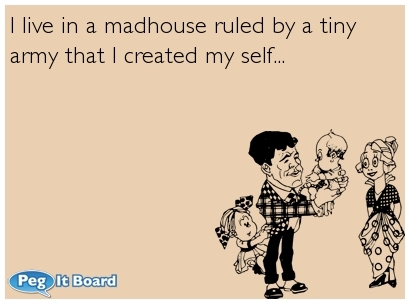 And really, the last thing the world needs is a “mini-me,” (because I am certainly not all that easy to deal with!) In the end, when they finally reach adulthood, I pray that I would have loved them through all of it. I know it will not be easy because I have high hopes and expectations (I’m still a mom after all!) But these years–the tweens and teens, the “home-stretch” if you will, are far too valuable to just endure. These are critical times. Love your daughter. Love your son. And remember, “he’s not you and she’s not me…” it just might make all the difference.